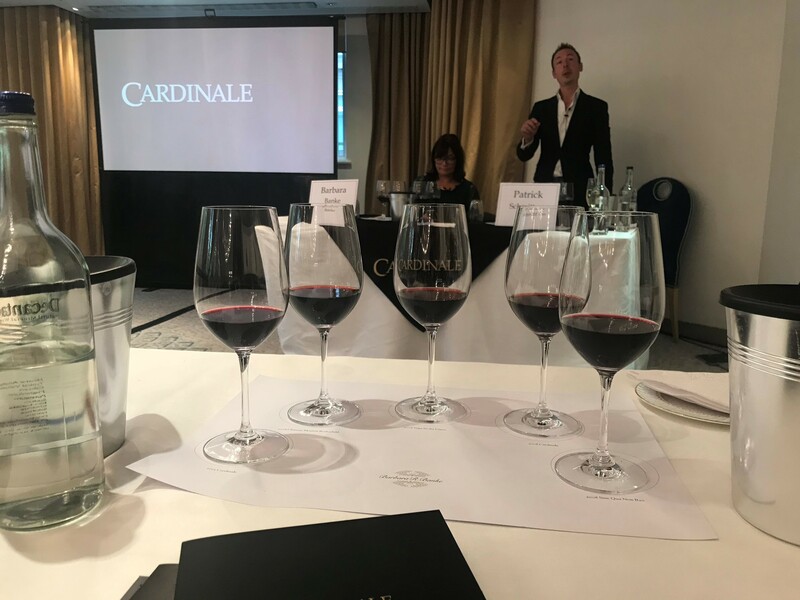 Yesterday I had the pleasure of attending the 2015 launch and masterclass of Napa Powerhouses Verite and Cardinale, hosted by the Jackson family at the Dorchester. It is always a real treat tasting these wines as you can really tell the time, effort and experience that have gone into both. Since the founding of Verite in 1998, Pierre Seillan (Head Winemaker at Verite) has identified more than 50 micro-crus along the Sonoma County, focusing particularly on Alexander Valley, Bennett Valley, Chalk Hill and Knights Valley. These micro-crus provide a complex palette of the aromatics, flavours, texture and structure that each wine needs. Having previously made wine in Bordeaux, Pierre decided he prefers to work in Sonoma, making wines without the rules and regulations of Bordeaux – allowing him to make some interesting and truly exceptional Bordeaux blends. The 2015 vintage in Sonoma is one of the best vintages ever (Pierre’s favourite being 1998) and although yields were low the concentration and quality of grapes really shine through. 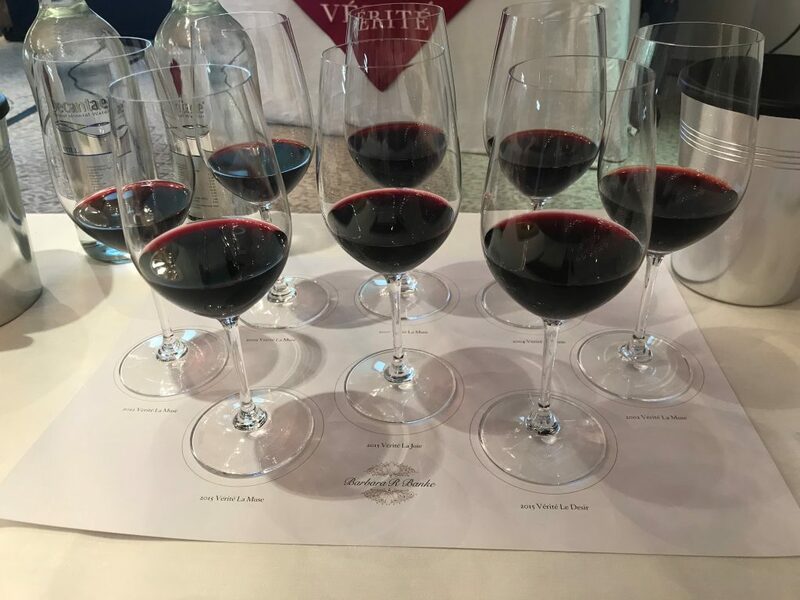 I was lucky enough to taste a vertical of 2015, 2012, 2009, 2007, 2004 and 2002; all were exceptional – the 2015 through to 2009 need more time in bottle however my favourite was the 2007 which has the silkiest tannins with powerful aromas of spice (coming from the deepest rooted vines) and black fruit – although I have to say, I loved them all! The second tasting I was lucky enough to take part in was a comparative tasting of Cardinale 2015, Cardinale 2008, Mouton Rothschild 2008, Vega Sicilia Unico 2008 and Sine Qua Non B20 2008. Cardinale was born in 1982 with a mission to produce a singular Cabernet Sauvignon from the highest quality vineyards in Napa Valley, and year after year they perform incredibly well, the 2015 is not an exception. Again, although it was limited in production the quality was fantastic. Cardinale 2008 fully outshone Mouton Rothschild in the comparative tasting and at half the price was pleasantly suprising! The 2015 Cardinale was difficult to compare to the 2008s as they were simply at a different stage in their lives. I would say however it was thoroughly enjoyed, with notes of spice, liquorice and extremely fresh fruit. I already knew this tasting was going to be incredible before I went, and I was not disappointed. It was a fantastic introduction to the 2015s and a great opportunity to see each wine and how it will evolve over time. I highly recommend stocking up on both Verite and Cardinale 2015 when they release for future drinking. To buy Verite or Cardinale or any other wines from the Jackson Family Estate please click here.